The Account Portfolio, which explains the specific characteristics of each type of account. The Deposit Rates schedule, which lists the deposit account interest rates that are in effect and are subject to change without prior notice. The Schedule of Fees, which explains the fees that may apply to deposit accounts and deposit services. The Electronic Funds Transfer Disclosure Statement, which explains the use of electronic transfers, deposits and withdrawals. The Check Hold Policy, which explains when deposited funds will be available for withdrawal. Other account opening materials, which are incorporated herein by reference. As used herein, the “Bank” refers to Presidential Bank, FSB; “Account” refers to any of the Bank’s deposit accounts; “Accountholder” refers to a deposit customer of the Bank having an ownership interest in an Account’ and “Governing Documents” refers collectively to these Rules and Regulations and the documents listed above. Upon opening an Account with the Bank, each Accountholder agrees to maintain the Account in accordance with the terms of the Governing Documents, as modified by the Bank from time to time, and in accord with applicable state and federal law. The Bank will provide copies of the current Governing Documents to each new Accountholder. The Bank is authorized to act on the signature of any of the Accountholders or Authorized Signers for which specimen signatures are provided on the signature card; the Bank may act on such signature, regardless of whether it is presented as an original signature or as a facsimile thereof. If an Accountholder or Authorized Signer uses a stamped or mechanically or electronically generated or transmitted version of the signature (including a signature transmitted by fax), the Bank is authorized to act on such a signature, whether or not specifically authorized by the signer. However, the Bank reserves the right, in its sole discretion, to refuse to acknowledge or act upon any stamped, electronic (including faxed) or mechanical signature; the Bank also may (but is not obligated to) require that a separate written agreement with the Accountholder must be on file with the Bank prior to honoring such a signature. At the request of an Accountholder or Authorized Signer, the Bank may agree to acknowledge a third person as the Accountholder’s attorney-in-fact. The Accountholder’s request shall be made either by designating the third person as a “Convenience Person or Power of Attorney” on the signature card or, at the Bank’s request, by executing a separate power of attorney in a form acceptable to the Bank. By designating a third person as a Convenience Person or Power of Attorney on the signature card, an Accountholder authorizes that person as an attorney-in-fact to do, execute or perform any act, deed, matter or anything whatsoever with respect to the Account that the Accountholder could do, as fully and effectively as if actually performed by the Accountholder. The Convenience Person or Power of Attorney’s authority shall be deemed a durable power of attorney and shall not terminate upon the disability of the principal; such authority shall, however, terminate upon the death of the principal. The Bank is authorized to honor the instructions or signature of an attorney-in-fact until it receives written notice of the revocation or termination of that authority acceptable to the Bank. Each of the Accountholders and the Authorized Signer(s) may individually and acting alone conduct any transaction with respect to the corresponding account, unless the signature card explicitly indicates that two or more signatures are required (excluding checking accounts). Each of the Accountholders of the Joint Account (“Joint Accountholders”) will be bound by any and all of the actions of any of the other Joint Accountholders with respect to the Account and will not hold the Bank liable in any way for such actions; each of the Joint Accountholders will be jointly and severally liable for the repayment of any overdraft, extension or credit, charge or expense with respect to the Account. Each Accountholder of a Joint Account appoints each of the other Accountholders, and each of the Authorized Signers, as that Accountholder’s attorney-in-fact with power to deposit to the credit of the Account moneys of any Accountholder and for that purpose to endorse any item payable to the order of all or any number of the Accountholders. Checks such as government and insurance companies require endorsements from all parties. If one or more Joint Accountholders owes the Bank money which is due and payable, the Bank may use the funds in the Joint Account to pay the debt. Unless otherwise indicated on the signature card and accepted by the Bank, in the event of the death of a Joint Accountholder, the funds in the account will belong to the surviving Joint Accountholder(s). Upon the request of a Joint Accountholder, or upon the receipt of the inconsistent instructions from any person or persons claiming authority over funds in an Account, the Bank may, at its sole discretion and without notice to any party to the Account, refuse to pay money from the Account or otherwise refuse to honor any instructions with respect to the Account until such time as the dispute or uncertainty concerning the Account is resolved to the Bank’s satisfaction. Whether the Bank exercises such right of refusal or does not do so, the Bank shall have no liability to any party to the Account for any payment of money or other transaction based upon instructions of any Accountholder or Authorized Signer, or for the Bank’s refusal to honor such instructions, as the case may be. Once the bank becomes aware of an accountholder’s death on a joint account the primary ownership may be changed by the bank for tax reporting purposes. Items presented for payment for the benefit of or previously authorized by the deceased accountholder may not be paid. Items deposited to an Account are credited provisionally, subject to actual and final collection. If the Bank does not receive final payment of an item, it may charge the item back against the Account. The foregoing also applies to items that are drawn on the Bank; such items are not finally paid until the Bank has determined that the item is properly payable. If a third party makes a claim against the Bank based on theft, forgery, alteration or any other claim affecting the Bank’s right to payment on an item presented by an Accountholder, the Bank may immediately withhold or deduct the amount of such claim from the Accountholder’s Account and, in the event that the Bank determines that the claim is justified, it may retain the funds as reimbursement. In receiving checks or other items for deposit or collection, the Bank acts only as an Accountholder’s agent for forwarding or transmitting such items through its correspondents, or directly to the drawee. The Bank assumes no responsibility beyond its exercise of ordinary care, and shall not be liable for losses arising from the error, negligence or insolvency of any correspondent or for losses in transit. The Bank is authorized to supply endorsements missing from any check or other item submitted to it for deposit or collection. Items received by the Bank are credited on the same business day, if received by 4:00 PM local time, and otherwise are credited on the following business day. An Account is considered to have insufficient funds when the balance is insufficient to pay a debit presented for payment. A portion of the balance in an Account is considered to be “uncollected” when it has not yet become “available” in accordance with the Bank’s Check Hold Policy. The Bank may refuse to pay and thereafter return any check drawn on an Account when the balance in the Account that would be necessary to pay the check is either insufficient or uncollected. Alternatively, the Bank may in its sole discretion pay any check presented against insufficient or uncollected funds, and may demand immediate payment from the Accountholder(s) of any resulting overdraft in the Account or may offset any such overdraft by applying to the repayment of the overdraft any funds held in another Account of the Accountholders(s) (including a Joint Account). Each check, in person withdrawal, ATM withdrawal or other electronic item presented for payment that exceeds an Account’s available balance is subject to an insufficient funds charge as stated in the Bank’s Schedule of Fees. The opening of an Account is subject to the Bank’s account opening policies and procedures in effect from time to time. The Bank reserves the right to decline to open any Account if the Bank is unable to obtain a reasonable belief of the true identity of the account owner or the person opening the account for an entity or to decline to open any Account for any other reason in the Bank's sole discretion. A zero balance may not result in account closure. Therefore, the account may be subject to posting of transactions and fees. To close an account you must notify the Bank in writing. Savings Accounts with a zero (0) balance for 93 days will automatically close. The Bank also reserves the right for any reason in the Bank’s sole discretion, with or without cause, to close any Account without prior notice to any of the Accountholders, by payment of the Account balance to one or more of the Accountholders. Upon termination of an Account hereunder, the Bank may return unpaid any item presented for payment against the closed Account, without liability to any party. If an Account is subject to a minimum balance charge, the charge will apply if the Account balance is below the minimum at the end of any day during the applicable period. In addition to the charges stated on the Bank’s Schedule of Fees, the Accountholder will reimburse the Bank for any out-of-pocket expenses it incurs when obtaining or providing any other services requested by the Accountholder. It is the Bank’s policy to permit Accountholders to withdraw funds from all Accounts without penalty, other than Certificate of Deposit Accounts, upon request. Federal law requires that the Bank reserve the right to require at least seven (7) days’ written notice of withdrawals or transfers from Savings Accounts and NOW Accounts. The Bank may limit daily cash withdrawals. A fee may apply to shipments of special cash orders. Additionally, Savings Accounts (including Money Market deposit Accounts) are limited to not more than six withdrawals or transfers to another Account in the name of the Accountholder at the Bank, per month. A penalty, as provided in the Bank’s Schedule of Fees, may be charged to the Accountholder if these limits are violated. For Accountholders who continue to exceed these limits on more than an occasional basis after being contacted by the Bank, the Bank may terminate Savings Accounts (including Money Market deposit Accounts), checking and transfer privileges. A withdrawal penalty will generally apply to withdrawals from a certificate of deposit Account prior to its maturity. Refer to the Account Portfolio and the text of the specimen Certificate of Deposit appearing elsewhere in the document for additional information on the withdrawal penalties applicable to the Bank’s certificate of deposit Accounts. No penalty will apply to a withdrawal from a certificate of deposit Account, however, under the following circumstances: (1) after an Accountholder’s death, if the withdrawal is requested with proper documentation by an authorized representative of the estate or by another Accountholder; (2) after the Accountholder has been declared legally incompetent; (3) if the withdrawal is made during the applicable grace period after maturity; or (4) IRA customers over 701/2. Any withdrawal from an Account requires a written request signed by an Accountholder or Authorized Signer. The Bank may require the use of its standard form for any particular type of withdrawal. If the signature card provides that more than one person is required to sign for the Account, then the required number of authorized persons must sign any withdrawal request. The signed written instructions presented in connection with a withdrawal request that is to be paid by wire transfer must include complete instructions that are sufficient to process the wire transfer including, but not limited to, purpose of wire, relationship to beneficiary, and complete beneficiary address. International wires may require additional information. When withdrawal requests are made in person, the Bank may require two forms of personal identification from each person signing the withdrawal request, including one form of personal identification which includes a photograph of the person identified. The Bank may refuse to accept any form of photographic personal identification if the photograph does not appear to be of the person presenting the identification, in the opinion of the representative of the Bank receiving the identification. The Bank may make a photocopy or electronic copy for its files of any personal identification presented in connection with any withdrawal from an Account. The Bank may require in its sole discretion that any withdrawal request for a cashier’s check or wire transfer payable to a third party, or for a cashier’s check to be mailed to an address different from the Account address, must be made in person. If the withdrawal is required to be made in person, then if more than one person is required to sign for the Account, all required persons must appear in person. The Bank may refuse to issue any cashier’s check that is not purchased by means of a withdrawal from an Account. A record will be made of the remitter for each cashier’s check issued by the Bank; the “remitter” is the name of the person whose funds were paid to the Bank for the purchase of the cashier’s check. Bank representatives may require suitable identification to ascertain the identity of any cashier’s check remitter. The Bank reserves the right to honor only those checks or other withdrawal or deposit forms that are obtained through, or approved by the Bank. Accordingly, each Accountholder agrees to purchase such items through the Bank or otherwise to obtain the Bank’s approval prior to their use. The Bank is not obligated to honor any restrictions (such as printed signature or amount restrictions, restrictive endorsements or any other type of restriction inconsistent with the basic payment order and amount) appearing on items presented against an Account for payment, although it shall have no liability should it honor such restrictions. The Accountholder shall date items drawn on an Account as of the day they are written. A stale-dated check is one that is dated six months or more before it is deposited or presented for payment. A post-dated check is one that is dated after the date it is deposited or presented for payment. The Bank may refuse to accept the deposit of stale- or post-dated checks, and it may refuse to honor such checks drawn against an Account. However, the Bank also reserves the right to honor such items presented for payment against an Account, regardless of their date. The Bank will not be liable for the payment at any time of any stale- or post-dated check, nor for any alleged costs or damages arising from the payment of such items or claimed as a result of the return without payment of other items as a consequence of the payment of a post-dated check. The Accountholder waives protest and notice of dishonor of checks and other items deposited. Additionally, the liability of the Accountholder, as endorser, shall not be released by the certification or guarantee of an item by the depository institution upon which the item was drawn. The Bank is authorized to provide Account statements, cancelled checks, images and other notices to the mailing address of record. Any items provided solely to the mailing address of record shall be sufficient for each Accountholder of a Joint Account or any other kind of Account. Accountholders shall promptly advise the Bank of any new mailing address for the Account by written notice to the Bank signed by an Accountholder or Authorized Signer or using Online Banking Secure Forms. The Bank is authorized to change the address of an Account for all purposes, based upon any form of written instructions signed by any Accountholder or any Authorized Signer; except if the signature card requires more than one signature to initiate transactions, then the same number of signatures will be required to authorize a change of the address of the Account. Such written instructions and signatures may be mechanically or electronically generated, stamped or transmitted (including by fax); however, the Bank reserves the right to require original signatures or the signatures of all Accountholders and Authorized Signers on such instructions whenever it deems appropriate. Electronic Account Statements may be required for some Accounts. The Bank reserves the right to correct any mistakes and change or adjust any Account entries which are in error, including amounts entered on its books and records, statements, notices and deposit receipts. 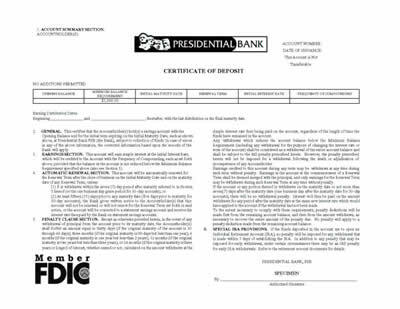 When the Bank provides a statement for an Account, the Accountholder must exercise reasonable care and promptness to examine the statement, together with any items accompanying it, to discover any posting or other statement errors or unauthorized transactions, or any unauthorized signature or alteration on an item, and must notify the Bank promptly after such discovery. If the Accountholder fails to comply with the duties imposed under this paragraph with respect to an item on which the Bank exercised ordinary care, the Accountholder is precluded from asserting against the Bank (i) the Accountholder’s unauthorized signature or any alteration on the item, if the Bank suffered a loss by reason of such failure; and (ii) an unauthorized signature or alteration by the same wrongdoer on any other item paid in good faith by the Bank after the first item and statement was available to the Accountholder for a reasonable period not exceeding fourteen calendar days and before the Bank received notification from the Accountholder of any such unauthorized signature or alteration. Without regard to care or lack of care by either the Accountholder or the Bank, when an Accountholder does not, within 6 months from the time any item and related statement are made available to such Accountholder, discover and report to the Bank any unauthorized signature or any alteration on the face or back of the item, or does not within 6 months from that time discover and report to the Bank any unauthorized endorsement of the item, then all Accountholders of the respective Account will be precluded from asserting against the Bank such unauthorized signature or alteration or endorsement. If the Accountholder fails to discover and report to the Bank a posting or other statement error within a period deemed reasonable by the Bank, but in any event within fourteen calendar days from the time the statement was made available to the Accountholder, then the Bank will not be liable for such error if the Accountholder’s failure to act in a timely manner causes the Bank to be unable to correct the error without cost to the Bank. A statement or item shall be deemed to be made available to the Accountholder on or about the third business day of the month. The Bank will accept a stop payment request on any Account with ACH or checking privileges. ACH stop payments are valid for three (3) years. Written check stop payment requests will be honored for a period of six months (verbal stop payments valid for 14 days). Stop payment requests are subject to a service charge as provided in the Schedule of Fees. The foregoing stop payment provisions do not apply to cashier’s checks. Any purchase of a cashier’s check from the Bank is deemed final, subject to the requirements of state law. The Bank may, in its discretion, refuse to honor any stop payment request on a cashier’s check. In the event such a stop payment request is honored, it may only be made by the remitter (or third party payee, if the check was received by the payee), must be in writing and notarized, with a declaration of the reason for the request, and must include an indemnification acceptable to the Bank, which may include an indemnification from the cashier’s check payee as well as from the remitter. If a cashier’s check stop payment request is honored by the Bank, nevertheless no replacement cashier’s check will be issued nor an available Account credit given, until nine (9) business days after the stop payment request acceptable to the Bank is made. The Bank will not accept a return for credit of any unused original cashier’s check, except from and for credit to the remitter and when accompanied by a written request for cancellation of the cashier’s check acceptable to the Bank. Prior to accepting such a return, the Bank may also require the same identification from the remitter as might have been required when the cashier’s check was issued. Whenever it appears to the Bank that an outstanding cashier’s check could have been lost, destroyed or misappropriated, then the Bank may, as a precautionary measure, return the cashier’s check unpaid if that check is subsequently presented for payment, without liability for any damages to the remitter or any other Accountholder. Such action by the Bank will not in itself constitute acceptance by the Bank of any stop payment request that has been made with respect to the cashier’s check nor obligate the Bank to give credit for the cashier’s check to the remitter, inasmuch as the Bank may still be liable upon the cashier’s check under applicable law. The Bank considers an Account, other than a certificate of deposit Account, to have become dormant if the Account has had no customer initiated activity (activity other than crediting of interest and other transactions initiated by the Bank) for a period of two years or more. Certificate of deposit Accounts are considered by the Bank to have become dormant, if there has been no customer initiated activity in the Account and no interest payments have been paid to the customer from the Account for a period of three years or more after the initial maturity date of the Account. The Bank's policy is to send a written notice to the Accountholder(s) of Accounts that it considers to have become dormant, which is mailed to the last known Account address. Such notice will request the Accountholder(s) to acknowledge awareness of and a continued interest in the Account. An affirmative response to such a notice from the Accountholder(s) is considered customer initiated Account activity, which removes the Account from its dormant status. Items may not be paid on Dormant Accounts. The Bank reserves the right, after notice is mailed to the Accountholder(s) at the last known Account address, to cease mailing regular statements for statement Accounts which the Bank considers to be dormant. Escheatment laws vary state by state. The Bank will escheat to the state of last known address of the account as required by that state. If an Accountholder owes any money to the Bank which is due and owing for any reason whatsoever, whether individually or jointly, the Bank may apply money in any Account of the Accountholder against the debt even if such application causes an interest penalty or the dishonoring of items drawn on that Account. This right applies equally to Joint Accounts, even if all of the Joint Accountholders are not liable for the debt being paid. If the Bank should incur any expense as a result of any action, claim, garnishment, attachment, investigation, verification, audit or subpoena relating to an Account or the Bank’s records of an Account, and with respect to which the Bank is not a primary party, the Accountholder agrees to reimburse the Bank for all such expenses. Those expenses include, but are not limited to, the reasonable costs of employee time, travel expenses, attorney’s fees actually incurred, and the Bank’s standard fees for research and reconstruction of records as provided in the Schedule of Fees. The Bank may waive any of its rights to collect fees, impose penalties or dishonor checks for insufficient or uncollected funds or for other reasons, or may waive other provisions of the Governing Documents or applicable law. However, no such waiver nor past practice of granting such waivers to particular Accountholders will affect or limit the Bank’s right to enforce the provisions of the Governing Documents or any other terms applicable to Accounts against other Accountholders or against the same Accountholders with respect to future transactions. The Bank may amend or revise the Governing Documents at any time. The Bank shall provide affected Accountholders with notice of any amendments to these Rules and Regulations, the Check Hold Policy or the Electronic Funds Transfer Disclosure Statement. Copies of the current Governing Documents are available at any of the Bank’s branches or at www.presidential.com. Your checking account consists of a checking sub account and a savings sub account. The Bank may periodically transfer funds between these two sub accounts. On a sixth transfer during a calendar month, any funds in the savings sub account will be transferred back to the checking sub account. If your Account is a Plan on which interest is paid, your interest calculation will remain the same. Otherwise, the savings sub account will be non-interest bearing. The savings sub account will be governed by the rules governing our other savings accounts indicated within the Withdrawals Section of your Account Rules and Regulations. This process will not affect your available balance, the interest you may earn, FDIC insurance protection, or your monthly statement.